When I went holiday party hoppin this weekend, I was just in the mood for something sharp. So I put together my take of a snazzy suit for the night. This Sugarlips blazer exceeded normal blazer expectations with its bold white piping and high cut in the back. Then, it clicked that it would perfectly show off and contrast the shiny pink of this duo colored shirt I got from In My Air's event a while back, where they sewed this shirt together right then and there. I went with my trusty metallic 3.1 Phillip Lims to bring out the shine in the outfit and left my jeans zipped just enough to reveal the heels. There just seems to be a little twist in each element of the outfit, which is exactly what you need to make something your own. So there you go, this is my kind of tailored. So classy Steph! You are a babe. you look so gorgeous as you always do!!! really smart and funky, love it! Great blazer, love this look! You look amazing, Steph! Lovin' your PLims! looking sharp ;) love the pop of fuschia in the back! Love you outfit.you look so pretty and amazing. That pop of color was so surprising, but it makes the outfit awesome! 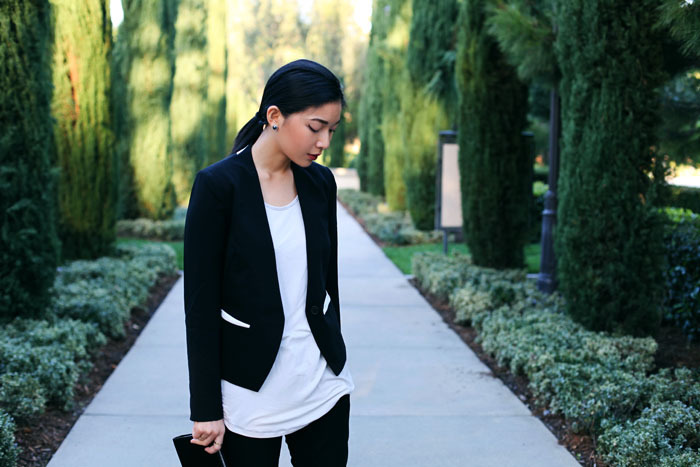 That's an amazing blazer, perfect for layering! This is such a fantastic look.. you styled your hair and make-up perfectly! I love the little details of this outfit. I adore the shoes and the unexpected pop of color! I love this tailored look!! Esp loving the shoes and the pop of pink.